LAKE BUENA VISTA, Fla., Sept. 19, 2017 — (PRNewswire) — Star Wars fans across the galaxy, get ready for a special Disney party you won't want to miss. Following a sold-out event last April, Star Wars: Galactic Nights is returning Dec. 16 to Disney's Hollywood Studios. This gala evening will be filled with out-of-this-world entertainment celebrating the entire Star Wars saga. 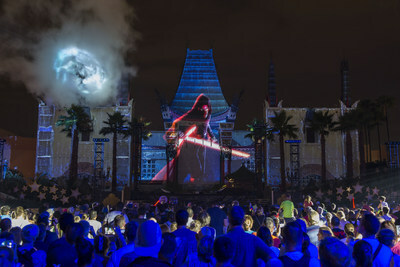 Among many thrills in store, guests will be treated Hollywood-style to a red carpet arrival, iconic attractions with little to no wait time, amazing fireworks and projections, and experts sharing details about the Star Wars expansion coming to Disney's Hollywood Studios. The Epic Theater plays host to a special one-night-only panel discussion about Star Wars: Galaxy's Edge, sharing some of the excitement coming to the 14-acre Star Wars-inspired expansion opening in 2019 at Disneyland Park and Disney's Hollywood Studios. Don't miss Darth Vader and a battalion of Imperial Stormtroopers march menacingly down Hollywood Boulevard. Come dressed in your finest Star Wars attire. Arriving park guests will walk a red carpet that runs the length of Hollywood Boulevard. The street itself will be dressed in all the trappings of a Tinseltown premiere. Callers to 407 WDW-PLAY (407 939-7529) will be able to sign on for premium offerings such as a Galactic Tasting Sampler (food and beverage items including lightsaber churros and a charcuterie with C3PO crackers). Park access and activities will be exclusive to Star Wars: Galactic Nights ticket holders. Event hours on Dec. 16 are 7 p.m.-midnight. Tickets are priced at $129 adults, $124 ages 3-9 (discounts available for Annual Passholders & DVC Members) and go on sale September 6. Call 407-W-DISNEY (407 934-7639) for details and to make reservations. April's event sold out; guests are encouraged to book early for Dec. 16 -- a date not far, far away. Disney Pixar's Coco To Receive "Hollywood Animation Award" Netflix's Mudbound To Receive "Hollywood Breakout Ensemble Award" At The 21st Annual "Hollywood Film Awards®"